entire game in an effort to ease his obvious discomfort. games and he remained out of action for the remainder of the month. there were too many lengthy stretches where he simply had no impact on games. that comes with a season spiraling out of control. tough and you can look at our point production and it’s not where it should be. player – and it showed. for the Vancouver Canucks is that players have ample time to heal their wounds. of mental scars a disastrous season like this one has left on the hockey club. Hey you guys know the canucks played last night right? No pre game? No post game? Canucks army has been playing like the canucks this season; very poorly. I blame management. Clearly CA lacks coherent direction. Bring back Gilman! or something. Get over it man, CA produced 81 times this season, chill. That’s about 60 times more than the real Canucks. And JD Burke only earns ~ 75% of Brandon Sutter’s salary. If CA wants to be taken seriously, they need to be professional. This includes game day material which doesn’t seem to be too tough. Clearly you don’t remember the cat Silverman post game reviews. Good article, quite candid by Hank. I’m probably one of the few Flames fans who appreciates how good the Sedins have been over the years. But you can sense in his words that the desire and effort it takes for 82 games is probably starting to wane at age 35. I don’t think that we as fans fully appreciate how truly beat up these guys get over the season, physically and mentally. Looking forward to all the draft articles and season review on each player. Next years lines are going to be very different. I’ll go over to hockey buzz to read their game recap. Best case we pick 1st , worst case 6th ? ignorant Neanderthals on and off the ice, is amazing. I pray that the Canucks are able to rebuild quickly enough that the Canucks are able to make another playoff run with the Sedins, even if in a depth role. Auston Matthews has an adorable dog. Appreciate the fantastic servants these two class acts have been to the franchise and the community but the writing is on the wall after this horrendous season folks – the Sedins MUST be put out as second line players now including the PP, as their endless cycling on the perimeter play is outdated and way too easy for the opposition to nullify. Valid points but most contenders don’t have the cap room. Canucks have a lot of potential. Who knows if it’ll turn into actual NHL talent. That may entice some decent free agents. The Sedins will retire as canucks then eventually go to the hall of fame, deservedly so. And I am a proponent of tough hockey, with big crashing wingers like the kings. The thing I know is the kings have an ex nhl vet named Sutter who knows how to get his players to give it there all. Henrik should have been shut down imho and he earned the right to heal up earlier.Desjardins is the guy who sends the twins out automatically on the pp each time and it is time to re evaluate this no doubt. Agree. It makes no sense why they wouldn’t give Henrik a 10 game recovery break, when the pros clearly outweigh the cons. With the state the team is in right now I think it is a waste to have their talent on it. Please Hockey or Viking gods, work out some deal that sees them go to a contender as a 2nd line where they play for a few more seasons and make a good playoff run. I suspect Henrik refused to take a break. Guy is totally competitive. Look at what he has played through. 1. If Burrows is bought out, the cap situation is very very good. 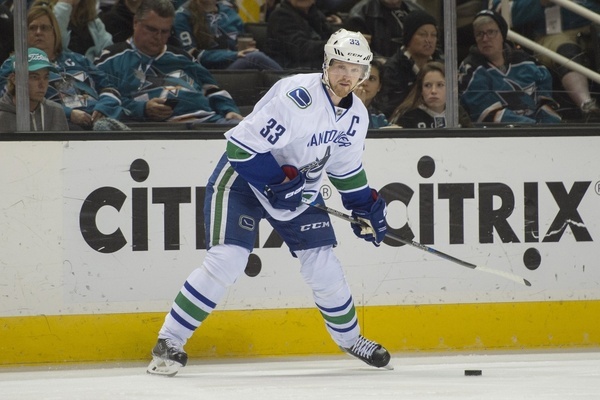 The Canucks could get a winger to play with the Sedins. While I’m appreciative of Hansons 22 goals, a true scoring winger could pot 35-40. 2. Young middle six forwards are everywhere. Many first round acquisitions, Bo, Jake, Sven, Emmerson, Jared add in Grandlund…. 4. Goalie situation is solid, in fact very good goaltending almost cost the Canucks a top pick. Next year Miller and Mark continue to split duty and Demko makes AHL debut. Going forward Mark and Dem… Millers 6 mil drops off after next year, so the Canucks will be FA players the next two off seasons. 5. Injured Players Sutter and Edler come back. While healthy Sutter was a legit 2nd line center. Horvat slides back to 3rd line and Faceoff win % goes way up. Between Edler and Hammer, the Canucks top 4 D rarely played together. The injuries tested both Hutton and Bo and they both passed with flying colors. 6. Being bad in a good draft year. If the hockey gods smile on the Canucks they will be fortunate to draft in the top 3 and get a real difference maker. In the NBA, the Spurs were bad for one year because of injuries, then we’re lucky to draft Tim Duncan. If the Canucks win the lottery, they will make the playoffs next year and continue to roll up the standings. What FA…l Stamkos, would look at a solid group of young forwards, a top 3 pick and a goaltending succession and sign up. One dark year, but the future is bright for the Canucks. Does anyone actually know how the lottery works? I mean by finishing 3rd last in the entire nhl, what is the worst pick we can receive and why? How many times does the simulator run to decide this? The system is a lottery only for the first 3 spots. Once those positions are drawn, all the remaining teams go in strict order of finish, so if 3 teams from above us ‘win’ top 3 picks, we are bumped to 6th place. if we dont win 1of the 3 lottery picks we pick 4-6 with many variables dependent on who wins each of the 3 lottery picks. So, in effect the draft lottery is alot like my last date night, the more balls you have the better. Woe, Canada, may next year be better for Thee. Its going to be most interesting on april 30. As bad luck as this city has had,the oilers have had the greatest luck and therefore I am rxcited we should be picking 3rd overall? Not my post, stupid troll!! No offense, but I’m actually appreciating the posts that come from the troll more than your actual posts. “Having your baby, what a lovely way to say I love you? And it’s really Me, Cruiser. I say trade the Sedin sisters to Montreal, get back Tomas Plekanec and David Desharnais. Foghorn I see you are anything but a Willy and Dorsett fan? Then it seems funny you do not agree with my postings as they are essentially the same as yours. BTW I guess that comment about your marching to a different lifestyle under your own username really pushed some buttons cruiser27 wannabe! Good you are the troll! So Daniel was calling out his brother in front of the media? OUCH. This was a tough season, I’m glad it’s finally over.